Dragons of Tarkir makes me feel a little bit like a Hollywood Movie Executive. I imagine my pitch for the third movie in a trilogy: “In this installment of Tarkir, Sarkhan travels back in time and saves Ugin. And when he saves Ugin, it gives rise to a new Era of Dragons. It's going to be like Groundhog's Day meets Dragonheart.” The Studio Executive replies, “Wait won't these dragons either eat you, shoot lightining at you or turn you into their subject as they became Dragonlords.” I think about this for a good minute and say to myself yeah, I am like a Butterscotch Krimpet to a Dragon. I have got to come up with a good thing to explain why Sarkhan won't be eaten. My answer is, Sarkhan is Unbroken, that with Sarkhan any Dragon can enter the Battlefield. The Studio Executive is only half satisfied with my answer, he brings up his next question, so only one person can talk to these Dragons? My mind wonders did I forget to mention the Shaman? No, Sarkhan is not the only human who can communicate with the Dragons, we also have a Human Shaman, a Dragon Whisperer. The Studio Executive looks pleased but still not quite satisfied. He pulls out the famous Executive question, “Who do you see in this picture?” My mind goes back to my initial pitch and I tell him Bill Murray and Sean Connery. The Studio Executive is thrilled. I am going to make Dragons of Tarkir, the biggest of the Trilogy. Even without explaining to the Executive that Dragonlord Otujai is hexproof. Illustrator and one twentieth the price of the Yu-Gi-Oh Japanese Blue Eyes Ultimate Dragon with Armor. Reindeer can fly but that Santa and the Easter Bunny are a secret holiday hit squad. best presents are those in foil packs, right? Well in case that doesn't quite work out, we have your Plan B.
can muster up enough disbelief for Planeswalkers but not Santa. These are only a preview of all the fun things Magic 2015 has to offer. I haven’t even gotten to the designer cards in this post, but if you look at Ob Nixilis, You will not something odd where the flavor text is. As I mentioned in an earlier post, Magic 2015 will be doing something brand new where if a card is designed by an individual or say the magic community, they receive a designer credit where the flavor text would be. I implore you to check out dailymtg.com and gatherer.wizards.com to check out all the new stuff! I hope you enjoyed this review of Magic 2015 and I can’t wait to see what’s in store for the rest of the year. See you soon! The amazing thing about Magic is how each new set manages to energize and challenge it's players. Conspiracy is not an exception but rather exceptional set. It's being described as a Multiplayer Draft Set. It's focus is on the draft and offering a better multiplayer experience. Conspiracy offers three new mechanics each designed to enhance multiplayer experience. 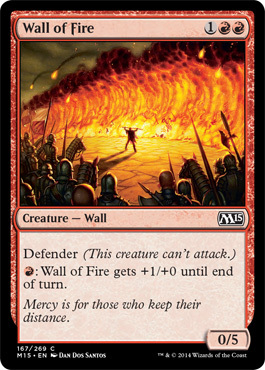 Dethrone attacks the player with the most life, allowing other players to gain ground and possibly extend the game. Will of the Council allows you to have a multi-option vote. Imagine how your group will vote on spells? Did I mention each player gets a vote but there are ways to earn more votes? Parley requests each player reveal their top card and for each non-land revealed each player gets to draw a card. Something positive happens for each player. These mechanics require you to have the ability to understand the dynamics of the group rather than the individual. But what about the draft part of that Multiplayer Draft Set description? The answer is Conspiracy is a medium size set. It only has 210 cards: 80 commons, 60 uncommons, 35 rares and 15 mythic rares. This increases the number of same name cards you can acquire. Team those multiple same name cards up with one of those Conspiracy cards and you can change the effectiveness of that card. It's as if each card you open in a booster pack can be a valuable card. It all depends on the other cards you draft. Sound appealing? What if everything you knew never was? What if your allies were really enemies? What if everything you knew about Magic: The Gathering was a lie? This June, you could give in to the…Conspiracy. Whether you believe in conspiracies or not, none can doubt the power of subterfuge, politics and misdirection. Even Wizards of the Coast knows its power, originally posting the information on Conspiracy in a coded cipher, teasing us with information we had to work for in order to figure out. Magic is changing things up this summer with Magic: The Gathering –Conspiracy and is sure to be loads of fun for you and your friends. All that remains is one question, what will you believe? The Born of the Gods Prerelease presents players with a special opportunity to open a Prerelease Pack and continue their journey down the Hero's Path. There are five Prerelease Packs to choose from; each color has a Heroic Path: White – Lead, Blue – Outwit, Black – Dominate, Red – Conquer, and Green – Thrive. Each Prerelease Pack contains items designed specifically for the chosen Heroic Path. For this event, players may use the promo card included with the Prerelease Pack in their tournament deck. We also have a bustling Commander community that is fanatical about fun and fair play, meeting every 2 weeks during the current season for Commander League games. Each season is 5 games long, and scores at the end of the season are calculated with each player's best 4 out of 5 games. We do give out small prizes and a major prize at the end of each season, but mostly its all about enjoying the game. Whether for any of the Born of the Gods events, to play some casual games with us or play in the Commander league, we would love to have you come by. Until next time folks! “Waste not, Want Rot…Not…I’ll stop I promise." Yes, rares and mythics will have a nice shiny Holofoil stamp imposed bottom-center on the card. 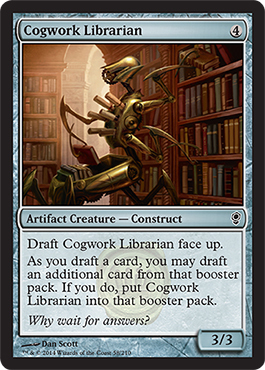 A designer credit where applicable will also be featured in place of flavor text, hinting at future contests and reprints of player-designed cards. With exciting news and big changes on the horizon, Magic is shaking things up yet again. Tune in next time for updates on Born of the Gods and upcoming products that are sure to delight, inspire and leave us wanting more... and wasting not. "Release the Krak-!, I'm sorry I just had to say it." An exciting new planeswalker greets us as the first major spoiler of Born of the Gods, Say hello to Kiora, the Crashing Wave! 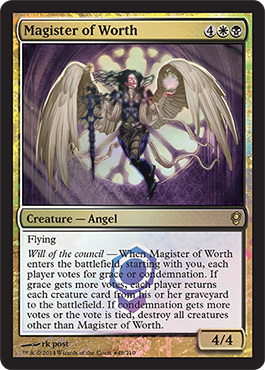 At 2UG, Kiora joins a cast of planeswalkers desired by competitive and casual players alike, but will she make the cut upon her release? With three very relevant abilities: pseudo self-protection, card advantage, tempo and an ultimate that puts opponents on a very short clock, all the signs are there for Kiora to be an all-star, but question remains: Will Kiora crest the waves and become a major player, or sink slowly into the depths? Only time will tell! Born of the Gods at the very least entices us with a new juicy planeswalker, but spoilers go into full swing on January 13 on Wizard’s of the Coast’s website, Dailymtg.com. If you enjoy spoiler season as much as I do, be there every night at 12:01 A.M EST to be ahead of the pack. Who knows? Perhaps a card get spoiled that will be a perfect addition to a deck you’ve built, or a powerful new card is revealed that turns magic upside down. If you enjoy waiting until prerelease to see all the cards, that’s fun too! Whatever the case, Magic: The Gathering is always growing and it would be a mistake to miss out! See you all next time, and until then, happy holidays from Themtgplace.com, Where the Magic happens!